In planning my trip to Europe, one of my “musts” included having a good place to temporarily call home when I arrived. It suits my personality to have a good anchoring experience lined up to get the travel off on the right foot and minimize the stress of adjusting from the comfort of home life to being on the road. I also wanted to use the opportunity to try some relatively new and untried (by me) methods for finding my way to share what the experience is like on the blog. Air BnB, Couchsurfing, and Work Away are three that I’m definitely giving a try. I’m several days into my first Air BnB experience, so I think I’m ready to talk about it. Air BnB is a web-based marketplace that let’s pretty much anybody, anywhere offer their extra room(s) up for rent. Offerors are encouraged to personalize their pitches — you are getting more than a room — you are getting an experience that includes at least a temporary relationship. This is probably not the place to go if you favor being faceless, anonymous, and oblivious to your lodging hosts. The wisdom of the crowd, in the form of feedback postings, is the means to evaluating the experience that you can anticipate and whether you will likely see a transaction as a good value. Feedback is invited from both hosts and guests, so hosts have a chance to avoid the potentially obnoxious as well. Air BnB does appear to have some kind of dispute intervention process in the event that things don’t go well, but thankfully I can’t comment on that part of the service. The real value of this seems to be in opening a market that just plain didn’t exist before. I wanted to find an interesting place to stay that would connect me to the community that I am visiting. I also needed to spend less than the numbers that were coming up when I plugged my dates and destination into the traditional travel search engines. Air BnB is arguably the best known of what seems like a multitude of web marketplaces that have sprung up in recent years that offered a potential match to what I was looking for. The interface is pretty similar to that of standard hotel booking sites. You enter arrival and departure dates, indicate price range preferences as desired, and enter a location by name, postal code, or by using a map. If I had needed to be at a specific place for the trip I am on, the service probably wouldn’t have worked for me. There are relatively few listings for any one place that might work for me as I am traveling in a pretty rural area. If I had been going to a big city, that probably wouldn’t have been a problem. The good news is that anyone can easily find out what the Air BnB market is in an area by just doing a search to see what comes back, Because I wanted to be in a region rather than in a specific town, the map search worked great for me. I was able to easily bring up a map showing all of the properties that met my price range bracket. It was then easy to take a look at each one that interested me. The listing information was rich compared to what I’m used to on mainline travel sites. That probably has as much to do with the eclectic set of listings collected by Air BnB as it does with anything that different about the listing tool itself. Let’s face it, the chain hotel scene is pretty generic and the listings look like pretty much the same offering at all of them. The ratings info does give a sense of which ones are paying appropriate attention to their business and their guests, but other than that there isn’t alot to go on to differentiate the choices. Not so on Air BnB. Differentiation is the name of the game and I found an eclectic variety of potentially interesting choices. The listings are full of quirks and personality. I found the reviews to be telling as well. They are about real people versus being about faceless operating functions. The hosts feedback about their guests was very revealing as well. 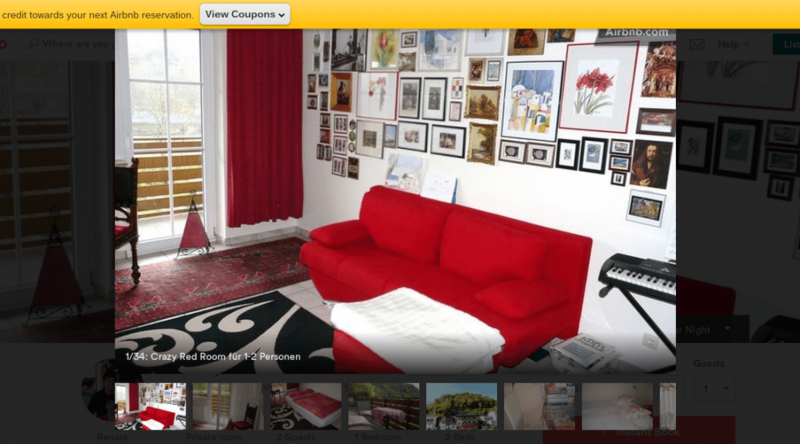 Based on my search, I chose the “crazy red room” in Renate’s BnB above Dietmar and Renate’s family-owned bakery …. not something I would have found on hotels.com. It has turned out to be a delightful find that fits my needs perfectly. Renate and Dietmer are friendly and welcoming hosts (as previous guests’ reviews told me they would be) and the room above their bakery was just as described. The cost is 1/3 of the lowest priced Expedia listing for their lowest price listing in the same general area. Reserving and paying from halfway across the world was easy. Air BnB accepted the credit card payment in US Dollars, gave me an immediate confirmation, and queued up an email message for me to send to the hosts to introduce myself. I was given a 24 hour before arrival, no obligation cancellation option. My introduction elicited a quick reply from my host which was very reassuring. As I understand it, Air BnB takes about a 20% cut for their services and then pays the rest to the host. I didn’t ask my host specifics, but from their brochure I am guessing that they mark-up their Air BnB pricing to cover the cut being taken by the company, so they are not out any additional cost. Renate told me that listing on Air B ‘n B is something of an experiment for her as well. It has not brought her alot of business, but it has brought some business from far away places she had never connected with before. She is hoping that continues and grows. When she and Dietmar became empty-nesters they recognized that they had extra space, and that is how they got into offering guest rooms. They have two rooms that they rent. Each day I’ve had the opportunity to chat with the hosts and have picked up valuable info that is enriching my explorations. I think we’ve built a nice, temporal personal relationship (as opposed to merely a transactional relationship. This is not that unusual for staying at a small bed and breakfast home ‘found through any method, but the point is that Air BnB specializes in and aggregates these kind of opportunities. So …a big thumbs up to my first experience with Air BnB. With just one experience under my belt, its hard to say anything definitive about the service in general other than I’ll definitely be trying it again.